One of the main muscles located at the back of the leg is called the Tibialis Posterior muscle. 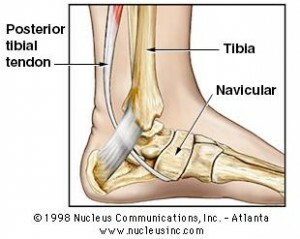 The main function of this muscle is to be able to hold the arch and support the foot during gait. Tendinopathy of this muscle is said to occur when it gets inflamed, torn or ruptured. Thus, the functional ability reduces causing a reduction in stability and support at the arch of the foot – causing flat foot. The severity of the condition can be determined with the aid of diagnostic imaging such as X-rays or Ultrasounds. Treatment plans will vary depending on the severity of the condition. It may range from active rest to the use of orthoses to offload and redistribute the pressure from the tendon, or possible surgery if there is a complete tear of the tendon.